Are you nervous about smiling openly and with confidence because of embarrassing tooth stains? The fact is, staining is common because the things that cause it are also very common. In most cases, stains are caused by the foods and drinks we consume on a daily basis. Other causes of staining include tobacco use and aging. Some medications even contribute to staining. If you’re self-conscious about sharing your smile, you’ll find the help you’re looking for at our Wakefield dental office. We offer two popular forms of whitening: in-office and take-home whitening. 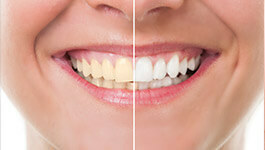 In-office whitening is a single-visit solution for creating a whiter smile. Over the course of one visit, our Wakefield dental team improves the appearance of teeth from six to ten shades. When you leave, you’ll have beautiful results you’ll want to share with everyone around you. Take-home whitening is an excellent alternative to in-office whitening. Using a set of custom-made trays and a supply of whitening gel, patients can expect to see results within one to two weeks when used as directed. Take-home whitening can also be paired with in-office whitening for results that are even more long-lasting. If you have questions about whitening options or aren’t sure which one is right for you, our helpful team would be happy to speak with you. Contact us today.